Takayama is a small town in the mountains, in Gifu Prefecture, that has become popular nowadays among tourists for the many examples of traditional wooden architecture making its historic center one of the most valuable and best preserved of all the Japan. In Takayama it also takes place, every year, one of the most important Shinto festivals in the country. 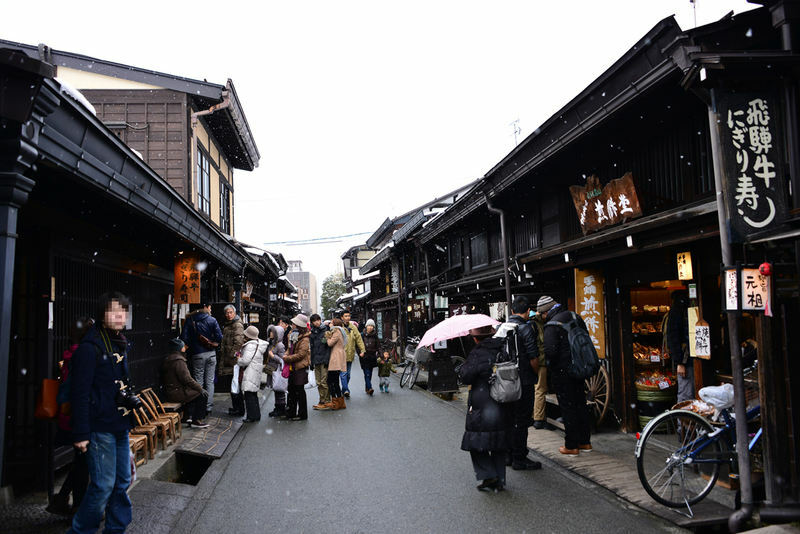 The old town is characterized by the presence of numerous ancient traditional wooden buildings, known as machiya, which in the past were the houses and shops of merchants and craftsmen. The most beautiful visitable machiya are Kusakabe and Yoshijima, located next to each other in the northern part of the old town. Many other buildings house museums and shops inside. Hirata Kinenkan (300 yen, 9:00-17:00), a real machiya that for centuries had been the home of a prominent family of merchants, now it exhibits various objects and historical documents. This building was a government building that was used for several purposes over the centuries, and continued to be used until 1969, when it was converted into a museum. The architecture of the main building dates from 1816 and inside you can visit the various rooms furnished with original objects: offices, meeting rooms, reception rooms, bathrooms, kitchens. Next to this building stands the greatest traditional rice warehouse of all of Japan, dating back to 1695, inside which today there are on display various items belonged to different feudal lords. In front of this building a flea market is held every morning, where to find products of local handicrafts, fruit and vegetables and various foods. In addition to the market near Takayama Jinya, another market is held every morning in Takayama, along the banks of the River Miyakawa. You can find mainly fresh fruit and vegetables and also various foods to eat on the spot, and in recent years stalls selling souvenirs and local crafts too. One of the two most important Shinto shrines of Takayama, located in the north side of the old town. On October 9 and 10 of each year, the monks of this shrine organize the autumn edition of what is considered to be one of the most important festivals of Japan, the Takayama Matsuri. Near this shrine there are also two small museums, the Yatai Kaikan and the Karakuri Museum. (admission 820 yen, opening hours 8:30-17, 9-16:30 dec-feb) An exhibition space in which there are four of the eleven floats used for the autumn festivals and other items related to the event. (admission 600 yen, opening hours 9:05-16:25) This small museum, known under two different names, exhibits a large collection of about 200 traditional lion masks from every corner of Japan. The main attraction of this museum are anyway the puppet shows that are staged throughout the day for visitors, every 15 minutes. 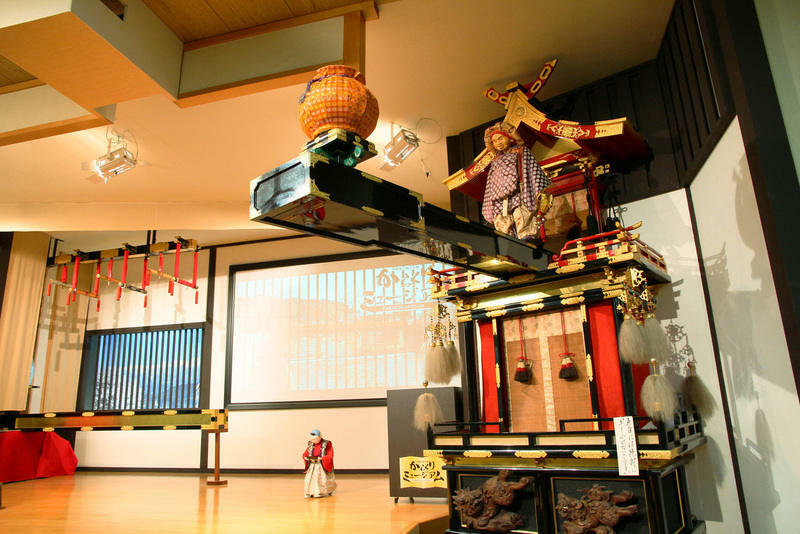 These puppets are called karakuri and had their origins in the seventeenth century, playing a role of great influence in the japanese theater. One of the two most important Shinto shrines of the town, located south of the historic center, about 2 km from Sakurayama Hachimangu. 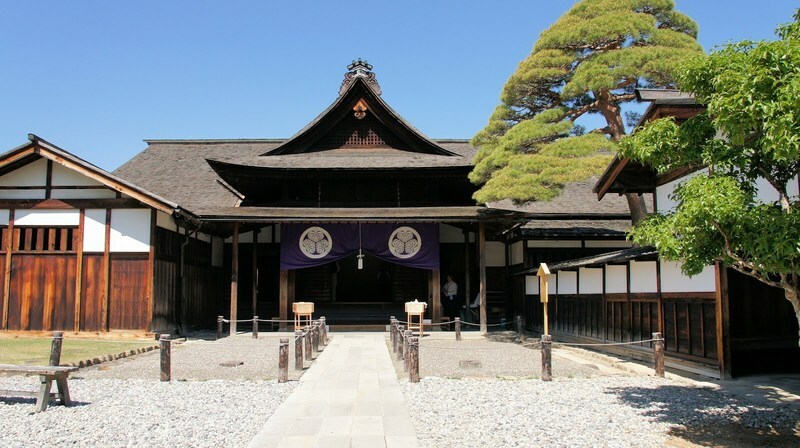 On April 14 and 15 of each year, the monks of this shrine organize the spring edition of what is considered to be one of the most important festivals of Japan, the Takayama Matsuri. To the south of the historic center of the town there is a large park on a hill known as Shiroyama Koen. Once on this hill stood a castle (Takayama Castle), destroyed in 1695, and today some ruins can be found around the grounds of this park. The park is partly crossed by a circular route of about 3.5 km, known as Higashiyama Yuhodo, a place where to take a relaxing walk in nature, passing through very small Shinto shrines and ruins of the old castle, all surrounded by dense vegetation. The park is very popular in springtime, when it's time to bloom for more than a thousand cherry trees belonging to a very particular variety, called in Japanese Yoshino Sakura. This park, located just over 2 km from Takayama station, can be reached on foot or by the tourist bus Sarubobo. 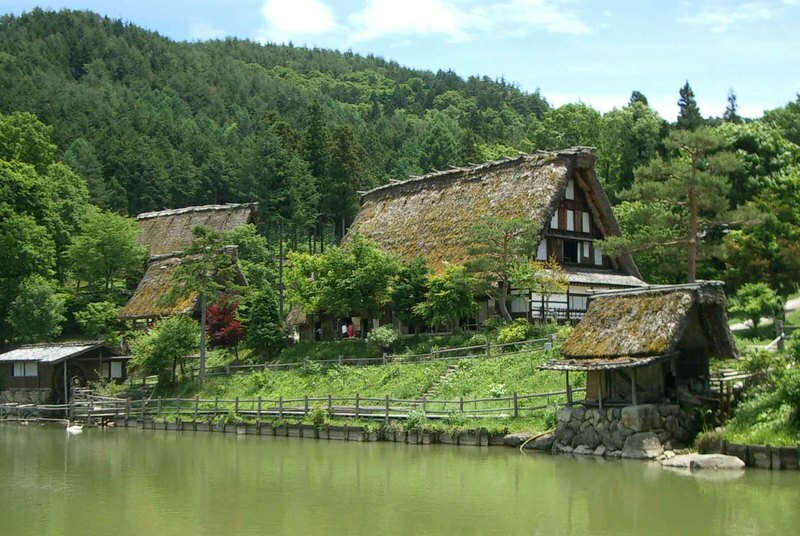 Inside there is a sort of open air museum which includes about 30 original traditional buildings, built in the surrounding region (in particular in Shirakawago) during the Edo period and moved to this museum in 1971. The buildings were chosen and selected in order to create a real agricultural village, offering visitors the opportunity to understand the daily life of the time, with utensils and various objects placed inside the various buildings. In this center, located near the entrance to the Hida Folk Village, for a small fee you can join classes in which you will be followed step by step in the creation of small traditional souvenirs, such as sarubobo dolls, sashiko quilting or ceramic bowls with traditional motifs. A museum located about 3 km south of Takayama station, it can be reached by a long walk or even by the tourist bus sarubobo (more info further down). 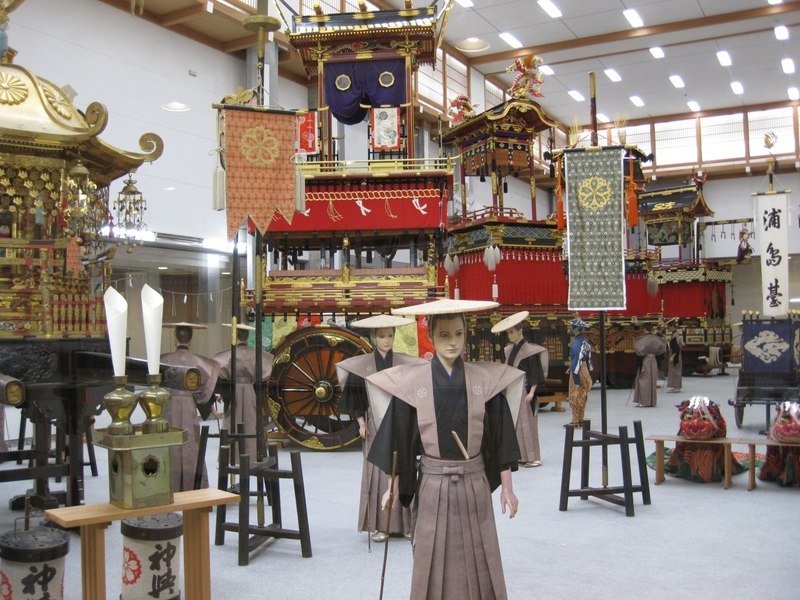 The museum is dedicated to the famous Matsuri festival held in the city of Takayama twice a year. Inside you can admire various floats used for the festival, both in miniature-size and life-size, the karakuri puppets, the taiko drums (considered among the biggest in the world). Inside the structure there is also a curious museum about insects (separate admission, 600 yen). In this place you can learn a lot about the legendary tea ceremony and also join a real one. For a price of between 1,000 and 1,500 yen you will be served a typical sweet (wagashi)and a cup of tea in a room with tatami mats and a garden view. In addition there is also a sort of museum which exhibits various objects related to tea and tea ceremony. This restaurant is located inside the old town and is very popular for tourists. Here you can taste the delicious Hida beef steak. A set that includes a steak and a plate of Hida soba, made with buckwheat grown in the area, costs 1900 yen. Restaurant in the old town where you can enjoy soba, hot or cold, accompanied by excellent tempura or vegetables. An old restaurant surrounded by a traditional garden in the historic city center, where you can taste the so-called shojin-ryori, Buddhist vegetarian kaiseki cuisine. It is very expensive but the culinary experience is unforgettable. A ramen with very fine noodles in miso broth. This dish is as simple as delicious, prepared by putting a magnolia leaf on the brazier and then cooking a mixture of miso, onions and shitake mushrooms on the leaf, and finally eaten accompanied with rice. The beef coming from farms in the surrounding area, very popular in Japan and perhaps second only to Kobe beef. You can taste it in various ways, the most flavorsome is definitely sukiyaki. Sweet balls of rice flour, skewered with bamboo skewers, poured with soy sauce and grilled. The Takayama area has been famous for centuries for the production of sake, the traditional Japanese alcoholic drink made from fermented rice. Even today, along the streets of the old town of Takayama, you can find some old still working factories, easily recognizable thanks to some particular balls made of cedar branches (sugidama) that according to tradition are hung at the entrance of each manufacturer of sake. You can visit the interior of these buildings and try (sometimes for free, sometimes for a small fee) different varieties of this traditional alcoholic drink. More information about all the most important producers of sake can be found in this page in English. The most recommended hotel if you're looking for a cheap accommodation near Takayama station, less than 5 minutes far on foot. Rooms aren't extremely small as if often happens in Japan. Excellent value for money, rooms are equipped with everything you need and the structure provides some services that are not always found hotels of this level, for example, the free coffee at reception. Singles from ¥ 5,000 yen per night. 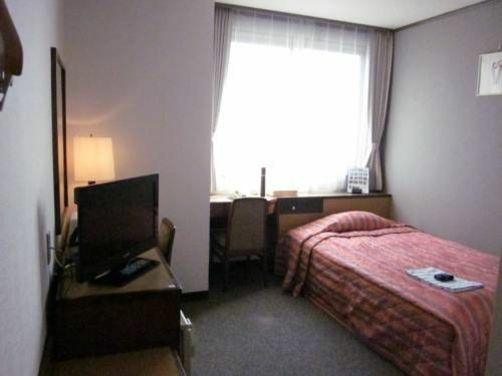 Located 200 meters south of Takayama station, this accommodation is perfect for those looking for accommodation near the station but also looking for a quality accommodation where to have interesting experiences. Main pros: the wonderful public baths on the top floor with panoramic views, a great breakfast, the rooms size, and rates, not expensive at all if compared to the level of this hotel: you can find single rooms on offer from ¥ 6,000 per night and double rooms from ¥ 11,000 per night. Takayama is known among tourists who go there as a historic city, so the few ryokan in the city are much in demand and prices are much higher than average. For this reason, in general it would be better to try the experience of staying in a ryokan in some less famous place, but if you have enough money to spend, it's undoubtedly a memorable experience.. This large ryokan is located on a hill just a few minutes from the old town, along the road to the Shiroyama Park. There are both western-style rooms and japanese-style rooms with tatami and futon, from ¥21,000 per night, breakfast included. Guests can enjoy a traditional dinner full of unforgettable delicacies for about ¥5,000. 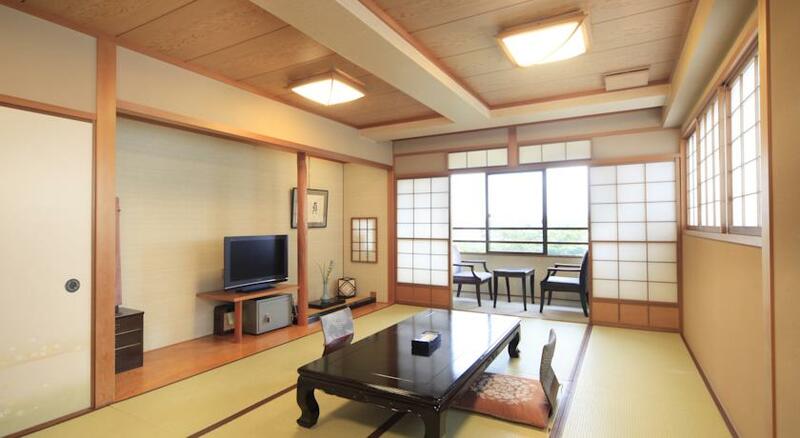 These rates are the cheapest ones among the high-end ryokan of the town. 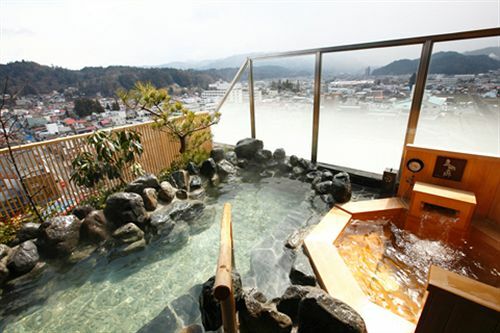 The hotel also offers a free shuttle to Takayama station and wonderful spa baths (onsen) available to all guests. Lastly, for an even more memorable experience, we recommend the rooms with external private onsen, from ¥ 60,000 per night (half-board). The historic city center is located about 600 meters east of Takayama Station, so it can be easily reached within a short walk. The city is well served by two lines of very comfortable tourist buses, details below. These buses, which make the last stop in the square in front of the station (east exit), go around the central Takayama, with several stops near various tourist attractions. At this link the detailed map of the route (blue line). 100 yen per ride. One departure every 60 minutes (timetable). These buses follow a wider route in the west and south of the city, stopping near some famous tourist spots a little too far to be reached on foot from the center of Takayama: the Hida Folk Village, the Matsuri No Mori and the Tea Ceremony Museum. At this link the detailed map of the route (red line). 210 yen per ride. Day pass 620 yen. One departure every 20 or 40 minutes according to the time of the day (timetable). Points of arrival in the city of Takayama are the JR Takayama station if you're travelling by train, and the Takayama Hida Bus Center if you're coming by bus, the last one located right next to the train station. The JR Hida limited express trains connect Nagoya (Nagoya station) with Takayama station in approximately 2 hours and a half, a one-way ticket costs 6230 yen. If you haven't got a Japan Rail Pass, I suggest to not to take into consideration the train option and get to Takayama by bus, journey times are more or less the same, but you spend half. The bus companies Meitetsu and Nohi Bus offer a joint connecting service through modern and comfortable buses. The journey takes about 2 hours and a half, and a one-way ticket costs 2980 yen, 5140 yen round trip (within 4 days). There is approximately one departure per hour. For all departure hours and details please visit the dedicated page in Meitetsu official website. At this link you can also make a reservation online. In order to get to Takayama by train from Tokyo or any other place nearby or north of Tokyo, first of all you have to get to Nagoya station in any way you want, and once you get there take the JR Hida limited express (see above). The bus company Keio Bus connects Tokyo (Shinjuku highway bus station) with Takayama in about 5 hours and a half, a one-way ticket costs 6,690 yen, 12,040 yen round trip (within 7 days). Further information on this page, where you can also make a reservation online. In order to get to Takayama by train from Osaka, Kyoto or any other place nearby or south of Osaka, first of all you have to get to Nagoya station in any way you want, and once you get there take the JR Hida limited express (see above). The Kyoto/Osaka line operated by Nohi Bus connects the two main cities of Kansai (departing from Osaka and making a stop in Kyoto) with Takayama in about 5 hours and a half, a one-way ticket costs 4700 yen (4200 from Kyoto). Further information on this page.